Description: P448, the eastbound Lake Shore, passes the coal tower in Chester. 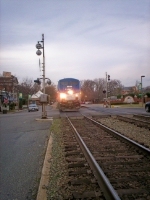 Description: Eastbound on the NS ex-PRR mainline at the Hammond-Whiting Amtrak station. Description: Amtraks "Silver Meteor" flies over The Ogechee River Just North of Richmond Hill. Description: The first P42 to be introduced to Amtrak brings the southbound Texas Eagle in to Dallas. 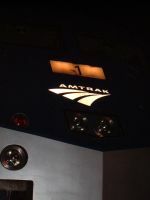 Description: Amtrak 80 with engine 1 at Winston-Salem NC. Description: AMTK 1 leads the Capitol Limited into Toledo Union Station on a mild autumn night in the Glass City with AMTK 6 following. Description: The Crescent (# 19) arrives in Birmingham one hour late. Description: An artsy shot of engine 1. Title: Amtrak 89 rolls through the station at 15mph then they will shove back on to the north storage track. Title: The coaches of P089 head back past the station. Description: Engine 1 on the point. Description: The Suset flys by at 79mph. Description: Amtrak's late running Lake Shore Limited meets an on time Empire Service train 287 at Milepost 215. Train 287 is waiting for the Lake Shore to pass in order to cross over from track 2 to track 1. Description: The southbound Crescent (#19) arrives in Birmingham about one hour late. Description: The southbound Crescent (#19) arrives at Birmingham Station about one hour late. Description: The southbound Crescent (#19) arrives in Birmingham one hour late. Description: P066 slides into a stop while blowing it's horn at some kids playing on the tracks...the engineer yelled at them from the window of the cab about it to! Description: the southbound silver star rolls on through for her T&E crew change at richmond and then onto Miami. Description: AMTK 1 moves right down the center of the street. Description: AMTK 1 passes right down the center of the street. Title: Coupling up No. 1 at 1:57 p.m.